How to get there: The normal starting point is the Yosemite Valley. Route description: The trail from Yosemite valley takes you south of Half Dome and around to the east (back) side. 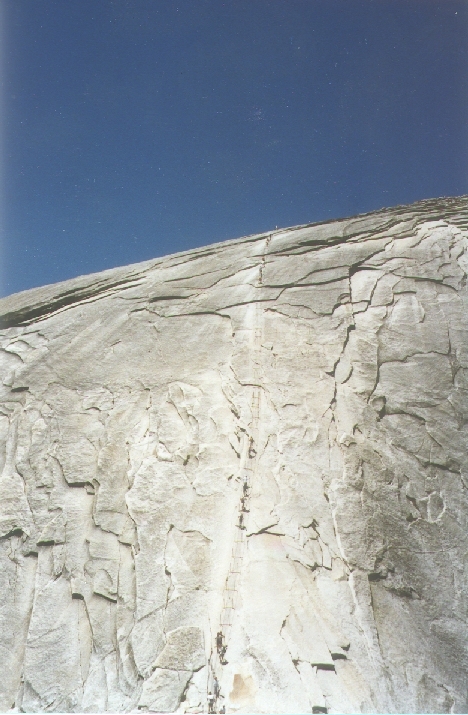 The trail eventually gains a ridge which is followed to the Dome itself. There is a cable strung along the mountain in order to help ordinary hikers make the climb. With the cable in place the final climb is rather easy. One should be aware of the weather conditions, and make certain that no thunder can approach while on the mountain or the ridge. Comments: The view from the dome all around Yosemite and in particular, back into the valley is breathtaking. There is an overhanging piece of the cliff called the Diving Board, be careful and avoid getting back down in only 10 seconds!